If you need support, please check the FAQ. Most of the common issues are listed there. 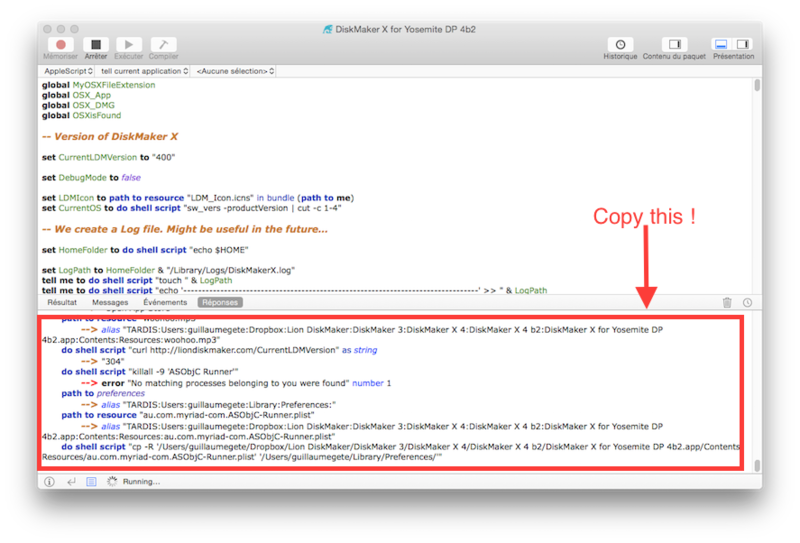 Sorry you had a problem with DiskMaker X. To help me to understand your issue, I need a bit more input from your side, especially your version of OS X which is running DiskMaker X. – Click on View menu > Show Event log (if it’s checked, don’t uncheck it). – Press the Execute button. When the error message happens, please go back in AppleScript Editor, copy the contents of the zone below the Replies button, and send it by e-mail. Send the lower part of the window, not the upper part! Then I will be able to analyze what happens. I try to answer to every problem within 24 hours.